This new edition of Alexander Miller’s highly readable introduction to contemporary metaethics provides a critical overview of the main arguments and themes in twentieth- and twenty-first-century contemporary metaethics. Miller traces the development of contemporary debates in metaethics from their beginnings in the work of G. E. Moore up to the most recent arguments between naturalism and non-naturalism, cognitivism and non-cognitivism. From Moore’s attack on ethical naturalism, A. J. Ayer’s emotivism and Simon Blackburn’s quasi-realism to anti-realist and best opinion accounts of moral truth and the non-reductionist naturalism of the ‘Cornell realists’, this book addresses all the key theories and ideas in this field. As well as revisiting the whole terrain with revised and updated guides to further reading, Miller also introduces major new sections on the revolutionary fictionalism of Richard Joyce and the hermeneutic fictionalism of Mark Kalderon. The new edition will continue to be essential reading for students, teachers and professional philosophers with an interest in contemporary metaethics. Alexander Miller is Professor of Philosophy at the University of Otago. Revised and updated guides to further reading, Miller also introduces major new sections on the revolutionary fictionalism of Richard Joyce and the hermeneutic fictionalism of Mark Kalderon. "No student or teacher could want for a more knowledgable and lucid guide - essential reading for any moral philosopher who wants to be taken seriously." "This remains the indispensable guide to the subject for advanced undergraduates, graduate students, and philosophers wanting to get 'up to speed' on the issues." "For many years, the first edition of Alex Miller’s An Introduction to Contemporary Metaethics has been the primary text for my course on metaethics. No text that I know of introduces students so thoroughly to the central theories, distinctions and arguments. The second edition fills in the additional background now needed. In particular, the expansion of the chapter on error theories is particularly welcome." "Given its breadth, thoroughness, and originality, Miller's An Introduction to Contemporary Metaethics is compulsory reading for everyone interested in metaethics. The updated material of this second edition guarantees that there will soon exist a second generation of metaethicists for whom reading this book is a formative experience." "An Introduction to Contemporary Metaethics provides for the first time a critical survey of famous figures in 20th Century metaethics together with in-depth discussions of contemporary philosophers and will be an invaluable resource for students, teachers and professional philosophers with interests in contemporary metaethics." "His discussion is always succinct, rigorous and lucid. The book will be very useful to upper-division undergraduates." "A precise and accessible reading of a rather complicated subject." "In this book Alexander Miller, an established expert in moral philosophy, provides a concise, clear and insightful account of the central issues of metaethics. He manages to make these difficult issues accessible to those who are new to this area of philosophy, while offering original contributions to the debates that will be of interest to experts in the field. This is an engaging and accomplished introductory work." "Miller’s book is ambitious, lucid, and comprehensive – an extremely useful and detailed study of the field. I wish it had been available when I taught my graduate seminar in moral realism, for it would have made an excellent reference work throughout the course – both for its clear exposition and its rigorous critical perspectives. I recommend it to all serious students of metaethics." 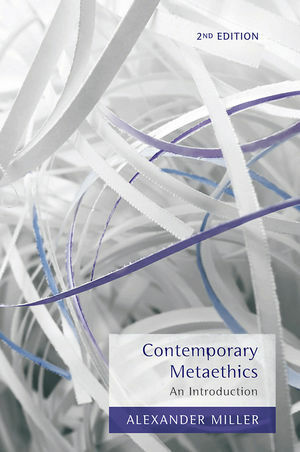 New edition of this highly readable introduction to contemporary metaethics which provides a critical overview of the main arguments and themes in twentieth- and twenty-first-century contemporary metaethics. Traces the development of contemporary debates in metaethics from the work of G. E. Moore up to the most recent arguments between naturalism and non-naturalism, cognitivism and non-cognitivism. From Moore’s attack on ethical naturalism, A. J. Ayer’s emotivism and Simon Blackburn’s quasi-realism to anti-realist and best opinion accounts of moral truth and the non-reductionist naturalism of the ‘Cornell realists’, this book addresses all the key theories and ideas in this field. As well as revisiting the whole terrain with revised and updated guides to further reading, Miller also introduces major new sections on the revolutionary fictionalism of Richard Joyce and the hermeneutic fictionalism of Mark Kalderon.